During assessment in places of detention (so for ADULTS) I had always used mechanical scales (the everlasting SECA). I would like to test a digital scale, and I am looking for advise on the model: who can help me? Please note that we tried models sold in local pharmacies, which proved to be not "heavy duty": after 200 weighting they start to under/overestimate (tested with a known weight of 10 kg) probably due to the fact they tend to loose the rubber feet insuring the balance. The key is to use proper medical scales rather than (as we call them in teh UK) "bathroom scales". Medical scales are better made (stronger) and mor accurate and precise. I have used (in surveys) Mardsen M-420 (they are light, quite cheap, easy to set-up - the "420BT model allows data capture using (e.g.) ODK on a tablet via BlueTooth but I have not tried this). I have also used the SECA 876 (light, easy to set-up (broad base), strong) in surveys. For clinical use, chair scales (e.g. SECA 952) might be useful. See your local SECA website for more information on SECA's full range. If you go digital make sure your buy sufficient rechargeable batteries and a charger. Many locally available "Made in China" batteries may need frequent replacing. A 10 Kg weight is find for testing children's scales but not for adults who will may weigh have average weights between 55 kg and 75 kg (females) and 65 kg and 90 kg (males). A weight of 60 Kg would be better. A good scale, should, however, be linear over very wide range. I had used a 10 kg known weight (even before, with the mechanical scales) due to the fact that is more "transportable" (2 small 5 liters jerry cans), and I can bring them to check the scales if any team has doubts about a scale performance. On the other hand it become quite difficult to have a 60 kg testing weight: I did not find anything on seca website, I can produce it with 3 20 liters jerry cans, but it is not very transportable. I was doubting on advising teams not to use their own weight to test the scales, because it can change due to drinking: I am wrong? A 5kg tare (market cast iron or sand replete bottle or weightliffter sport weigth, etc.) should be enough for digital scale. Generally, digital adult scale have a 100g precision. That mean your scale would measured correctly between 4,9-5,1kg the tare. If you plan to use thoose scale in the field, you'll need a transporting bag (protection against dust and humidity) and a wood board (40x40cm) as a hard support for the scale. Both could be produce locally at very low cost. NB: Crude wood support will twist with humidity, prefer plywood to avoid this poblem. Also, Tanita Scale brand had good medical adult scale at fair price (but Seca is still the 'gold standard'). Damiens tips are all useful. Any "medical scale" (there are rules relating to what can and cannot be called a "medical scale" and a typology of scales bases on performance and applications) will have been carefully designed to be linear over the range for which the scale has been certified (i.e. the magnitude of any error will be unrelated to the magnitude of the mass being measured). This means that, provided your test weight is good and is not very close to either end of the certified range, it should be good enough to act as a quick check and for daily calibration. You can buy certified test weights. These are used in laboratories, calibrators of industrial (mostly chemical and food processing) machinery, and by government "weights and measures" regulatory staff. Large calibration weights are, however, very expensive. Smaller weights are affordable. 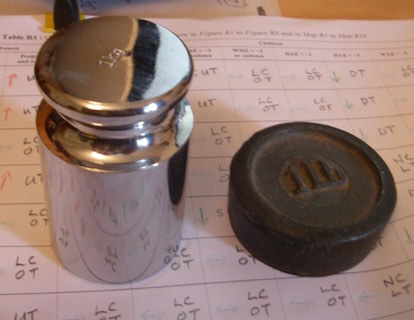 A commerce grade 1 Kg calibration weight will usually cost less than fifteen USD. A laboratory grade 1 kg calibration weight might cost USD200. Purchase and use of these weights is probably not warranted unless you need to check many scales over time. How's that for charisma? BTW ... 1 lb is the old Imperial measure (one pound) and is about 0.454 kg (still used in some countries). You do need to be careful about testing with your own body weight as this changes with hydration, clothing, gut contents, &c. throughout the day. A small wine-class of water will (e.g.) add 200g to your weight. (1) The weight of the container. A standard 10L plastic fuel can in the EU weighs about 680g). (2) Fullness of the can. For a nominal 10L can to be holding 10L it should be full but not overfull. Fuel cans are designed to hold their stated capacity with a small air space to allow for expansion with heating. With the can standing on level ground, you should not fill the can beyond the bottom edge of the filler neck. Filling to the brim may result in an extra 50g. With a less than careful use of a 10L can you can end-up calibrating a scale so that the measured 10Kg is actually 10.7Kg. For case-finding this will increase sensitivity particularly when using tared scales to measure the weight of children. For BMI, much of the error will be lost in error in the squared height measure. BTW : MUAC is replacing weight for many purposes. If your motivation in using weight is to measure change in weight then accuracy is not very important. You want precision and linearity for that. Many thanks for all your suggestions, extremely helpful - I will have the wood board for the scale done, in prisons of sub-saharian Africa the soil is not very flat, I should have thought this long ago. We also measure MUAC, but since we repeat survey, we see again many detainees (they can't go far :-) we take advantage to see which malnourished (on BMI base) had lost weight. So for the time being (waiting to convince ICRC to purchase a totally chic calibration weight) I can go ahead using my 5 lit jerry can (weighted with a SECA digital scale, model 1004): no problem for the weight of the container, I know that the total (water + container) should be 5 kg. I will try with sand, less "losable". I am fully aware of the "container issue", since we find here in Mali "20 liters" buckets with graduation and all (5-10-15-20), but they cannot take more than 17 liters!!! Maybe they refer to some Chinese unit!